HomeHow does getting a second dog change your relationship with your first dog? A reader recently asked me how my relationship with Jana changed when I brought Cali home. Cali was an 8-week-old puppy; bringing an additional adolescent or adult dog into the family would probably affect the older dog differently. I expected Jana to want nothing to do with the puppy, but within a day, she was gently playing with Cali and allowing her to share her bed. Jana was a fantastic big sister, and, as I said in response to this question, we “co-parented” Cali. This mostly worked out well. Jana definitely helped Cali learn where to toilet, for example; Cali was a very clean puppy who had no accidents. 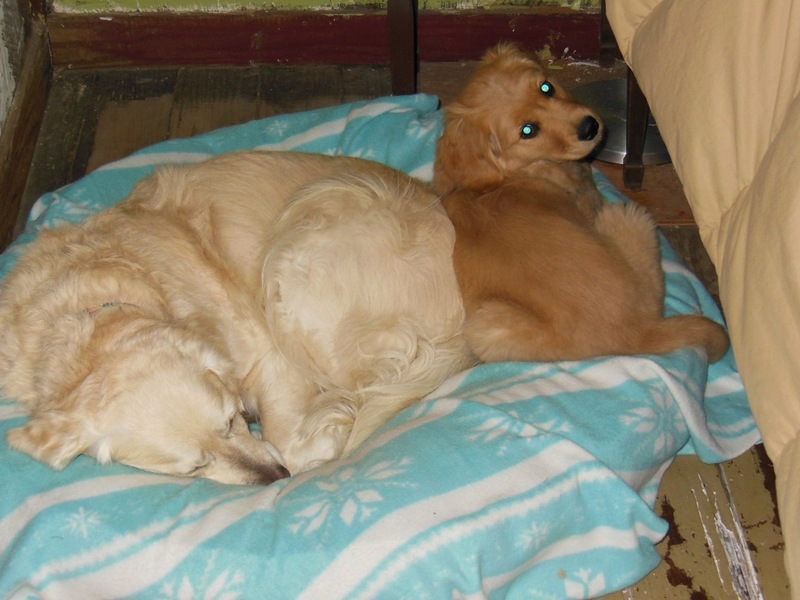 I taught Cali many of the house rules, such as which furniture dogs could and could not use (this did not always go so well); Jana taught her other house rules, such as the “egg rule” — anyone who makes eggs has to make enough to share with all family members. Cali has, in turn, taught that sacred family rule to Koala. 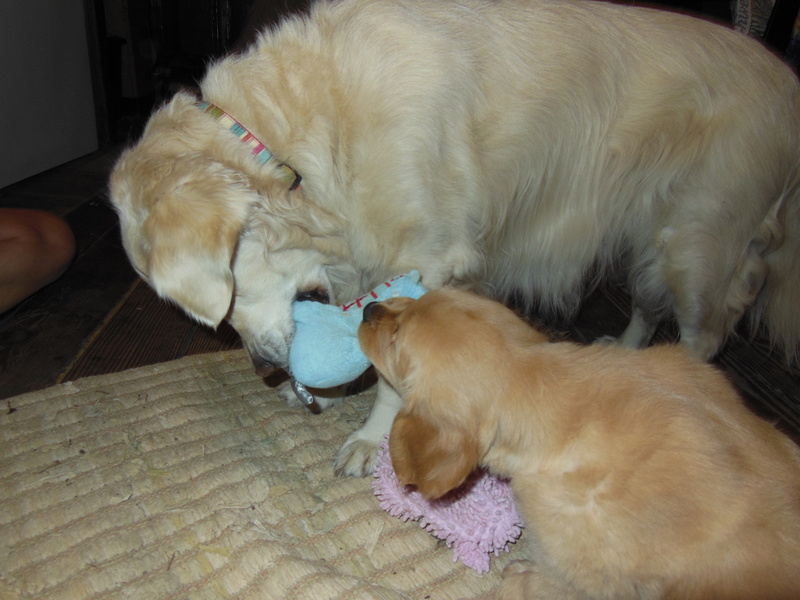 Jana was protective of Cali and taught her to play tug and keep away and other essential dog games. She led by example, showing Cali that the play tunnel was fun, not scary, and that nail trims and toothbrushing led to tasty treats. When we went to the dog beach, Jana provided thorough instruction, including demonstrations, of how to get soaked and then wriggle in the sand to ensure maximum coverage and sand retention for the ride home. Cali has surpassed her teacher in this endeavor. As for my relationship with Jana, well, we were the grown-ups, nurturing and educating the baby. Jana and I shared many eye-rolls watching Cali’s puppy antics. We took walks together to enjoy some adult time, and I tried to reinforce Jana’s status as the second-in-command. Jana was not shy about asking for belly rubs, games of tug, or walks to the places she wanted to go. Cali is pretty easygoing, but she did try to steal Jana’s bed and claim more than her share of attention, and she sulked if Jana or I rebuked her. I think what’s hard about adding a dog of any age is giving each dog individual attention. Jana and Cali were very different personalities, in addition to being at completely different stages of their lives. Jana was slowing down, due to arthritis and age, just as Cali became an active (very, very active) adolescent and young adult. I hated leaving Jana behind to do active exercise with Cali, and I hated denying Cali the hiking and other activities that Jana and I had enjoyed when she was young. So we made a lot of compromises. I took Cali to agility and Jana to nosework classes. I took everyone to the beach. Every day, we walked, at Jana speed, to a park where Cali could race after her ball while Jana socialized with the other adults (humans) and a couple of other older goldens. I’d like to think that each of my girls got what they needed and deserved, but I am sure there were times when one or both felt that her sister was claiming too much time or attention. ← Is Cali a Wagg’n Dog? Perfect topic for us as we are embarking on a quest for another golden retriever and let’s face it, for Eldridge too! Thanks Pam, hugs to you and sweet Cali. Sounds like you have done a great job balancing between two sometimes different sets of needs and the gap in ages. My two Goldens, Kali (going on 9 years) and Kloe (almost two years) were in a similar situation, We had rescued Kali at 5 years old and had established routines and rules well in place when we adopted Kloe at 9 weeks two years later. I wasn’t sure but I thought over time Kali would come to appreciate and love her little sister. Within a day Kali, like your Jana, was sharing the responsibilities of parenting and showing Kloe the ropes and setting a good example. 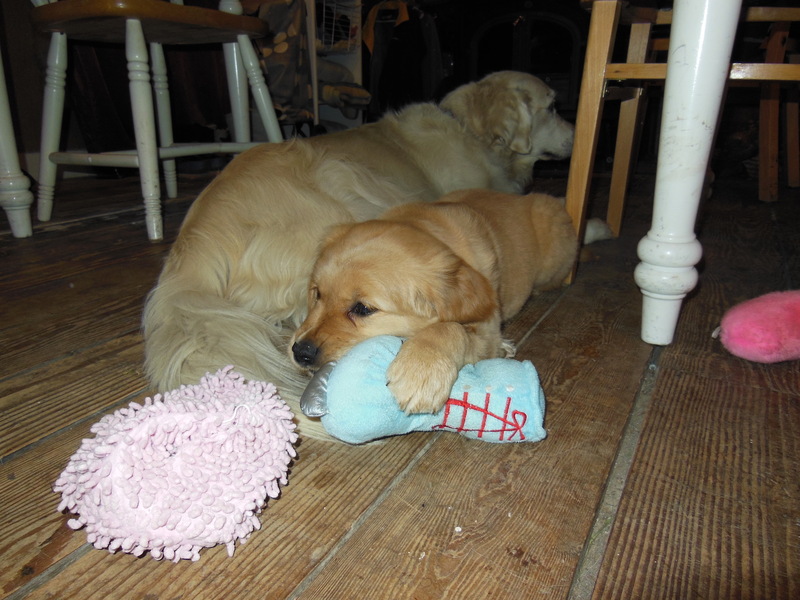 From day 1 Kloe eagerly sought out Kali for wrestling and tug of war. Kali was so gentle and kept things even until a point when she had enough and she let Kloe know it was time to rest, which Kloe reluctantly did (at least for a few minutes). It’s funny now to see Kloe at 80 pounds have the advantage size-wise over Kali at 60 pounds. But Kali uses her experience and smarts to keep things even often ending up with the prized rope toys under her belly or chin after a rough match after getting thrown around by “little” sister Kloe. Kali has slowed down quite a bit over the past year and we are thinking about adding a new pup so that rough play can be between the youngsters while Queen Kali sleeps in the sun.